Brady Landscaping is a family owned company with over 15 years experience. Like most businesses, we started off small. Year to year we have grown through personal referrals and our solid reputation. Today, Brady Landscaping is a full service landscaping company serving local residents and businesses. Anything from mowing and mulching to a complete landscape design and implementation, we have the expertise and experience to fulfill your landscaping and maintenance needs. 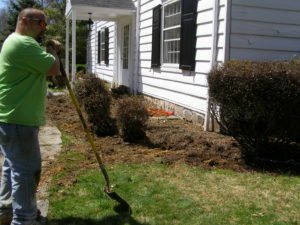 What makes us different from other landscaping companies is our friendly and personal touch. We get to know our clients because we listen and work with you, to make sure the end result is what you want. We communicate with you so there are no surprises when the work is complete. We are honest and fair and keep our prices highly competitive. Many of our clients have been with us for 10 years or more. Give us a try and let us show you how we are different. Brady Landscaping looks forward to hearing from you! Serving these communities – Bucks County: Solebury, Buckingham, Doylestown, New Hope, Dublin, and Perkasie. Montgomery County: Telford, Hatfield, Souderton, Lansdale.